Learn about the art of Feng Shui in a free workshop February 9 at the Pearl District’s Atelier Lapchi. 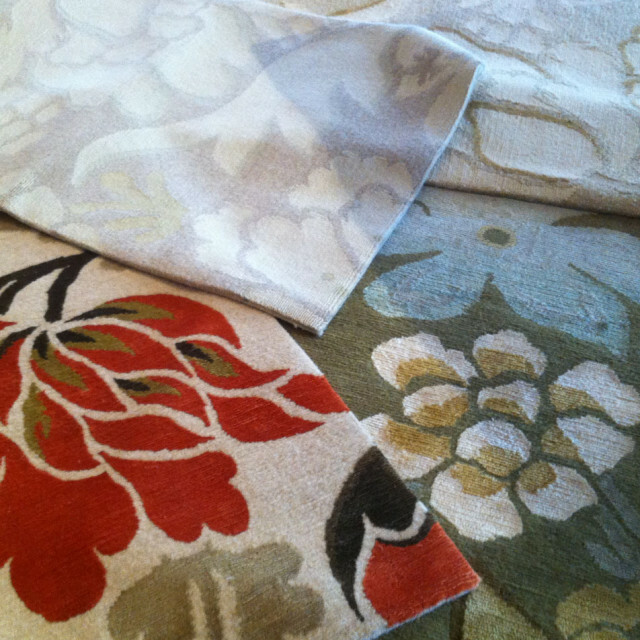 The same rug pattern can have a whole different look, depending on colors, ratio of silk to wool threads, and other individual choices you make when investing in a custom rug; here, four versions of a Lapchi design. As it is now, the new Atelier Lapchi – the showroom for the Southeast Portland-based rug company – is a lovely, airy space, strangely luxurious with its smooth concrete floors, warehouse-high ceilings, floor to ceiling windows and beautiful array of silk and wool rugs. But what will it look like later this week after Feng Shui expert Cindy Garreton takes a look at it? Come see what she does to balance and harmonize the already zen-calm space, and hear her talk about the principles of Feng Shui. Her presentation on “Feng Shui: Foundation for Design” is part of a new monthly event series Lapchi is launching to activate their spacious three-month-old “Atelier” showroom space. The talk is Thursday February 9, 2012 at 4.30. They’ll have a reception starting at 4 pm and refreshments too. These days you could buy a Lapchi rug online, but seeing (and touching) the wool and silk creations in person is so much more satisfying, even if you don’t buy one. Depending on the light and the angle at which you look at the rug, its silk threads will show either more shimmer or more color and contrast. The effect is mercurial. All the rugs Lapchi makes and shows in their Atelier are custom ordered, though you could certainly mosey in with your backpack like my brother and walk out with a rug rolled up under your arm. But better to choose a pattern and tailor it to your own unique creation; there is no extra charge (or lead time) for custom orders varying size, color, and mix of wool and silk. Even the scale of a pattern can be zoomed up or down depending on your vision. The rugs are made in Nepal, where a strong community of weavers carries out the ancient tradition of Tibetan hand-weaving; these craftspeople have imported their skills for political reasons from Tibet to the more peaceful neighboring country of Nepal. Everything in the process from sheep-shearing on is done by hand, though none of it by children. In fact, Lapchi helps fund and participates in a rug certification non-profit called GoodWeave, which ensures that no child labor goes into the rug making, and instead builds and sponsors schools for children who might otherwise be working in a South Asian carpet factory. It seems fitting that GoodWeave invests in children’s education, since the rugs Lapchi makes are definitely heirlooms, good for many generations to love. If you’d like to go to Garreton’s Feng Shui lecture, please RSVP TO ATELIER.PDX@LAPCHI.COM.